Habitat for Humanity of San Antonio is an ecumenical Christian organization working in partnership with God’s people in need of a decent and affordable home. 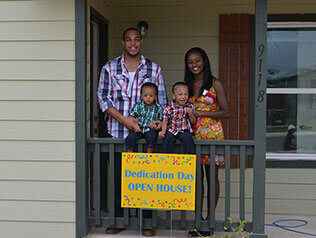 Habitat builds new 3 & 4 bedroom homes. Each home has two full baths and costs approximately $75,000 – $80,000. We offer a 20-year loan with NO INTEREST! Payments are approximately $600 per month (including homeowner’s insurance and property taxes). A non-refundable $1,750 down payment is required (covers first year homeowner’s insurance, property taxes and closing costs). An additional non-refundable down payment amount is required for any home options selected at the Lot Selection process. Once in the program, 300 sweat equity hours of time and labor must be invested in your home as well as homes of other Habitat households. Homeowners attend required homeowner education meetings. It takes an average of 9 – 12 months to complete the program. 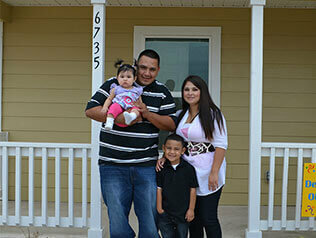 To see where we’re currently building Habitat homes click here.